Prime Life, where luxury meets affordability … now your dream home can be a true reality! 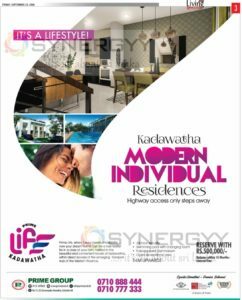 Be in a class of your own, nestled in the beautiful and convenient locale of Kadawatha, within direct access of the emerging Transport Hub of the Western Province. Available for Rs. 14 Million Upwards, Reserve today by Paying Rs. 500,000/- and balance within 18 months-interest free. The Colombo skyline is changing, and in the heart of its distinguished uptown neighbourhood, will lie a modem marvel designed for livability and dipped in luxury. Surrounded by iconic landmarks and stunning ocean and lakefront views will be Capitol TwinPeaks. 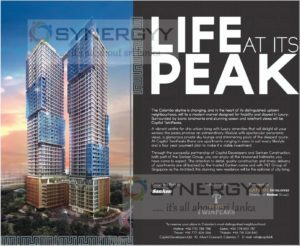 A vibrant centre for chic urban living with luxury amenities that will delight all your senses; the peaks promise an extraordinary lifestyle with spectacular panoramic views, a glamorous private sky lounge and shimmering pools of the deepest azure. At Capitol TwinPeaks there are apartments ranging in sizes to suit every lifestyle and a four year payment plan to make it a viable investment. Through the successful partnership of Capitol Developers and Sanken Construction, both part of the Sanken Group, you can enjoy all the renowned hallmarks you have come to expect. The attention to detail, quality construction and timely delivery of apartments are all backed by the trusted Sanken name and with P&T Group of Singapore as the Architect, this stunning new residence will be the epitome of city living. M C Urban Developers Limited a member of Millennium Housing Developers PLC commence their new Housing apartment project in Colombo 5 Facing to Nawala – Narahenpita main road. The buyers at present have the luxury of reserving the apartment at 30-40% less than the price when it is completed. A guaranteed high rental income because of the strategic location of the apartment. The Heights Colombo 5, with an assurance of greater energy savings with Solar PV system for the common areas of the apartment and a rain water harvesting system offering a higher way of life to its residents. A project by Millennium City, Sri Lanka’s leader in mega township development for decades. An ICTAD C1 graded for Building Construction Company which adheres to strict project management and maintaining high standards assuring pristine quality, timely deliveries. The 14 storied apartment with 64 intelligently designed units different to each other, with four very unique penthouses with two breathtaking panoramic views of both day and the lit-up Colombo city night time view. 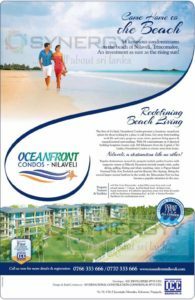 ICC Developers (Pvt) Ltd leading private company into the business of building and constructions announces that the company has start building 54 luxurious condominiums on the beach of Nilaveli, Trincomalee. The first of it’s kind, Oceanfront Condos presents a luxurious oceanfront option for those looking for a place to call home. Get away from bustling work life and enjoy gorgeous ocean views, spacious living spaces &. tranquil natural surroundings. With 54 condominiums in 4 identical building footprints located only 260 kilometers from the Capital of Sri Lanka, Oceanfront Condos is a home away from home. Popular destinations around the property’ include golden beaches with turquoise waters at Nilaveli. Excursions include temple visits, scuba diving, golfing, fishing and whale watching, visits to Pigeon Island National Park, Fort Frederick and the Kinniya Hot Springs. Being the second largest natural harbour in the world, the Trincomalee Port too has become a popular attraction in the area. 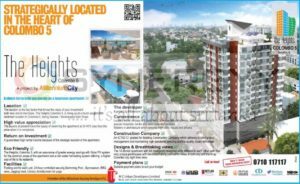 Don’t miss this opportunity to own your very own condominimum near to famous holiday destination of Sri Lanka.